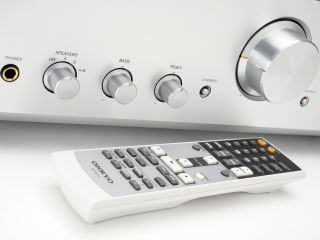 Japanese home entertainment company Onkyo has announced the launch of its first HD DVD player, the DV-HD805. It is set to become one of the first HD DVD players to take advantage of high-bit-rate audio streaming using HDMI version 1.3a. The DV-HD805 is designed to partner with Onkyo's 2007 A/V receiver line-up . Both the HD DVD player and the A/V receivers feature HDMI version 1.3a connections, making them a good platform for high-definition 1080p movies. It also nicely complements Onkyo's A/V receivers by streaming the new lossless surround sound formats, Dolby TrueHD and DTS-HD Master Audio, as well as two 'lossy' formats, Dolby Digital Plus and DTS-HD High Resolution Audio. The Onkyo DV-HD805 has the capability to support different frame rates, including playback at 24 frames per second, which is the native frame rate of the original sources for most HD content. This is great because it means you'll be able to play back films recorded to HD DVD with the smoothest, most stable reproduction possible. Can HD DVD beat Blu-ray? HDMI version 1.3a allows the DV-HD805 to offer the full potential of high-definition 1080p video. Furthermore, HDMI version 1.3a enables 'Deep Color' technology to improve colour tones and achieve finer colour gradation. HD DVD specifications allow for the inclusion of web-enabled network connectivity to develop new and unique content such as additional materials and bonus features. In addition to downloading content, HD DVD users also have the ability to upload content and interact with providers - by participating in interactive polls, for example. Compared to other media formats, HD DVD is advanced in this capacity. The DV-HD805 includes an Ethernet port to allow you access to these capabilities, as well as let you easily download any future firmware updates. The DV-HD805 will be available in the autumn at $899 (£450). Hopefully it will launch in Europe soon after that, because we could certainly do with some more high-end HD DVD players over here.